BERKELEY, Calif. -- A judge on Friday set bail at $135,000 for far-right activist Kyle Chapman and remanded him into custody on a felony charge of possession of a leaded cane for allegedly brandishing a lead stick at a rally in Berkeley on March 4. Chapman did not enter a plea in court Friday and was taken back into custody. At a brief hearing which was guarded by seven bailiffs who checked the IDs of everyone who entered the courtroom, Alameda County Superior Court Judge Mark McCannon also told Chapman, a 41-year-old Daly City man, that if he makes bail he should not possess any sticks or weapons and he should stay at least 300 yards away from Civic Center Park in Berkeley, where an anti-Marxist rally is planned for Sunday. 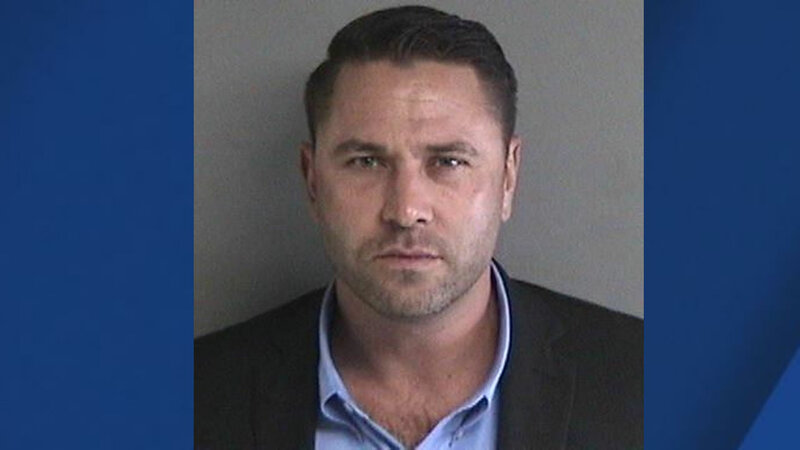 This is a mug shot of Kyle Chapman who was arrested on March 4, 2017 after a violent right-wing protest in Berkeley, Calif.
McCannon ordered Chapman to return to court on Sept. 5, when he's expected to enter a plea. 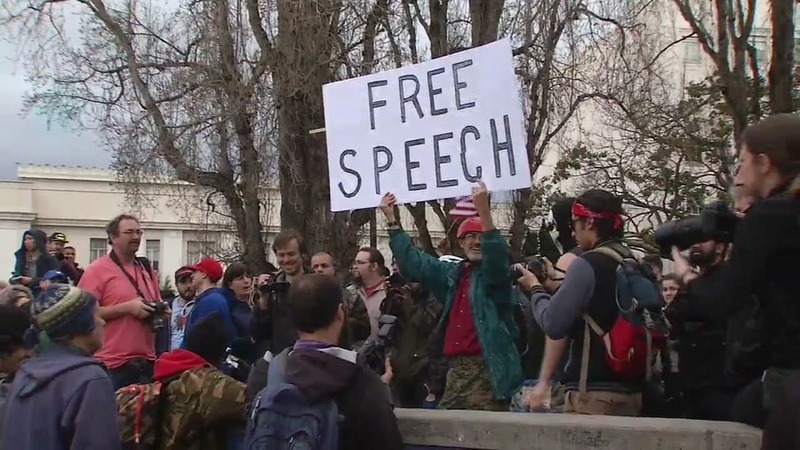 The Alameda County District Attorney's Office filed the felony charge against Chapman last week for his actions at the "March 4 Trump" rally at Civic Center Park in Berkeley on March 4 in which Trump supporters clashed with counter-protesters. Berkeley police Officer Darrin Rafferty wrote in a probable cause statement that there were multiple instances of violence between the two groups and Chapman was identified as one of the people causing violence. Rafferty said that, based on a video that he reviewed, at about 3:05 p.m. on March 4 a man later identified as Chapman who was wearing a black baseball helmet, goggles and a backpack with metal buckles sprayed what appeared to be pepper spray into a crowd of protesters Chapman's group had been arguing with. Rafferty said a short time later "Chapman was involved in multiple altercations with many people" and "was swinging what appeared to be a wooden stick at many people." Rafferty said, "It was unclear if he hit anyone, as the camera did not stay focused on him during the entirety of this altercation." Rafferty said that at 3:21 p.m. he saw Chapman swing his sign, which was made of a long piece of lumber at a woman who was wearing a purple jacket but he was unable to tell if she had been hit or if the sign hit someone else. Rafferty said that after he reviewed videos of the clash at the rally "it is clear that Chapman was in possession of a piece of wood that had been fashioned and carried as a weapon." Rafferty said, "Specifically he had a large stick with two small American flags attached to it." Chapman's lawyer, John Noonan, said after the hearing Friday that he doesn't know if Chapman will be able to make bail. Alameda County sheriff's spokesman Sgt. Ray Kelly said his office provided tight security at Chapman's hearing because of the tensions that have erupted at right-wing rallies across the country. "Security was of the utmost concern," Kelly said. Prosecutors say that Chapman has two prior convictions, one for grand theft in San Diego County in 2001 and one for robbery in Texas in 1993.